Bittersweet Enchantment: Book Spotlight: Kissed by Kimberly Loth + Giveaway: win a copy of Kissed & $10 Amazon GC! 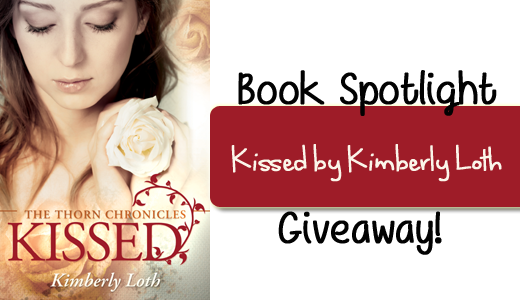 Book Spotlight: Kissed by Kimberly Loth + Giveaway: win a copy of Kissed & $10 Amazon GC! Hello my awesome readers! What's shakin' ? 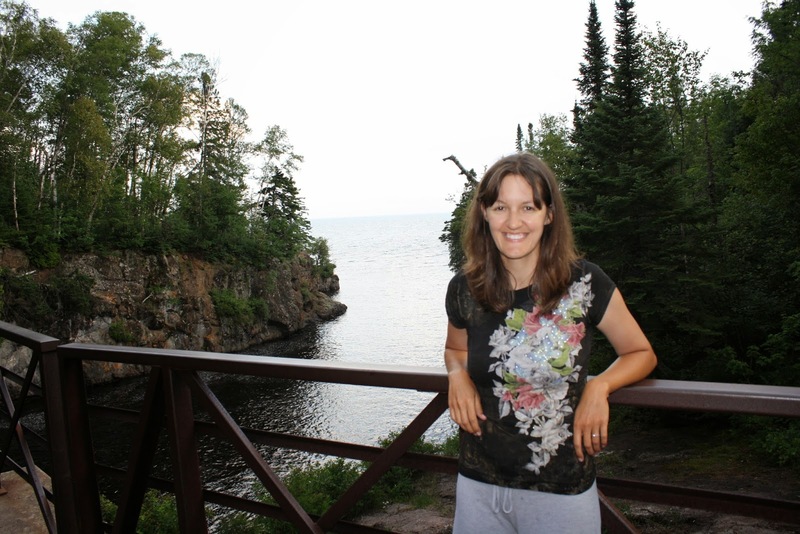 Today's post is spotlighting author Kimberly Loth and her NEW book, Kissed! Kissed is a YA Paranormal Romance novel and was recently released on April 21st. Kimberly's book sounds amazing and I am super excited to be able to share all about it with my readers. 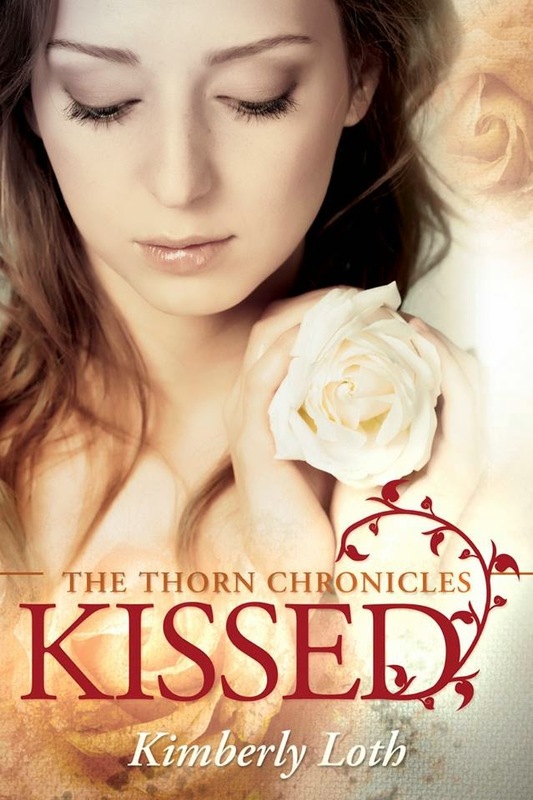 There will be a giveaway as well for a copy of KISSED and a $10 amazon GC. Birthdays are supposed to be special like my Kaiser Wilhelm rosebushes. They bloom once a year, huge violet and crimson cups full to bursting with petals. When I part the petals with my nose and inhale, I go weak in the knees from the fruity perfume. But my birthdays are more like the daisies that grow alongside the roses. Ignored. The sink looked odd next to our front door. My mother had it installed after I kept tracking in dirt and fertilizer from my green house. I washed the soil off my hands with the warm water and used a file to clear the dirt out from under my nails. Then I exchanged one dirty pair of ugly tennis shoes for a pair of clean ugly tennis shoes and made my way into the kitchen. Mother didn’t allow a speck of soil from my greenhouse to dirty her home. Paint on the cabinets peeled away in white curls. A single light bulb gave enough light to cook but not enough to read a recipe. My mother stood by the tiny window, her bottle blond hair twisted in a bun on the back of her head. She wiped her hands on her apron then smoothed a stray hair from my braid. I knelt down to tie my shoes, anything to avoid her touch. Physical touch burned, even something as little as a finger brushing my forehead. “Wash your face. We have guests for dinner.” My stomach knotted. I tied and untied my shoes three times, wondering how to respond. Years ago, my father had closed our home to visitors. No one crossed our threshold. I was allowed to leave only to go to school and to church. Well, if you want to call it that. I’ve watched movies in school and I went to the Baptist church until I was eight. Our new church, Crusaders of God, was a bigger shock than no more pants. But Mother and Father called it church. “Why?” I asked. My curiosity overrode my memory of the last question I asked when Grandma died and I wanted to know why I couldn’t go to the funeral. I stood and waited for the slap and a lecture. Instead, she smiled like she was hiding something important. Of course. Friends of my father. Nothing ever happened in our house unless he was the center of attention. Even on my birthday. At least they remembered. The surprise concerned me though, as the last surprise they announced turned out to be a drastic lifestyle change complete with long denim skirts and strict obedience. Oh, and no more birthdays. Until now, apparently. Maybe the surprise would be that my father finally found his sanity. That would be an amazing birthday present. I doubted I’d get that lucky. Dinner took place in the dining room. The cheap chandelier struggled to fill the room with light as two of the bulbs were out and nobody bothered to replace them. Our mysterious dinner guest turned out to be familiar. And not the good kind of familiar either. Dwayne Yerdin sat at the table. He was a senior at my school but ended up in quite a few of my classes even though he was two years older. I probably shouldn’t judge him. But with his heavy lidded, half closed eyes, buzzed head, and classic bully laugh, I had disliked him the moment I saw him. Perhaps he would prove my judgment wrong tonight. Seated next to him was a pudgy man in a suit. He wore a tie, but his neck was too thick to fasten the top button. He had the same heavy lidded eyes as Dwayne. My father, a tall thin man with thick blond hair, saw me waiting in the doorway. My father indicated the chair next to Dwayne, but I sat across from him instead. My head buzzed with the act of disobedience and the air smelled faintly of wisteria. I almost smiled. A look of irritation passed over my father’s face, but he didn’t say anything. Next to my father, the pudgy man stared at me with piercing gray eyes. My mother served us all pot roast and baked potatoes. She piled every plate high but hers and mine. Hunger kept me humble. And skinny. I focused on my food most of the dinner, not wanting to meet the pudgy man’s gaze. Or Dwayne’s. His eyes shifted rapidly around the room as if he were looking for the nearest exit. But when his eyes met mine he smirked, like he knew something I didn’t. My father and Mr. Yerdin talked of politics and religion, not once acknowledging that anyone else sat at the table. Of course, I shouldn’t have been surprised since more than one sermon had been preached about the place of women and children. We were inferior and didn’t deserve an opinion that differed from our husbands’ or fathers’, so it was best that we just didn’t say anything at all. As the conversation turned to the medical experiments Dad performed on the dog that had been dumped in our yard last week, I tuned out and tried to think of what I would get if I crossed an Iceberg rose with a Sunsprite. A nice pale yellow and only a few thorns. Could be interesting. If Grandma were still alive, she’d appreciate it. A quick glance at the clock told me they’d only been here forty-five minutes, but it felt like days. After another excruciating hour, Mother presented the cake. The carrot cake (my father’s favorite) had sixteen candles on it. I had not had a cake with candles since my eighth birthday. On that day, the cake was chocolate, my favorite, but that was before Father went insane. I missed those days, the ones before he went crazy. When he would come home and take me canoeing and fishing. When we would wake up early on Saturdays and go to breakfast at Sheila’s Café. I blinked back tears thinking of the father he used to be. After the cake, I moved to help my mother clean up, but Father put a hand on my wrist, a signal to stay seated. The skin burned where he touched it. Dwayne shrugged and shifted his eyes. Me, I kept my mouth shut and listened for the words that weren’t being said. “And she’s a virgin.” My father spoke this a little too loudly and I flinched. My mother paused before picking up Mr. Yerdin’s plate. She met my father’s eyes and nodded. Then the corners of her mouth turned up ever so slightly. My stomach sank at the thought of what my birthday surprise would be. Although part of me did not want to hear the rest of the conversation, but to escape back into the quiet world of flowers and dirt, another part of me needed to know what my future held, where being a virgin was important. I cleared my throat. Dwayne smiled a wide toothy smile and my father glowered like I’d done something wrong. Which, of course I had, but it would be worth the punishment if I got the answers I needed. “Could someone please explain?” There. I asked the question. So out of character for me and yet satisfying in a strange way, like the way I felt when a teacher praised me for a good job. I bit my bottom lip and tasted butterscotch, which was weird because the cake we had, contained nothing of the sort. While I knew asking questions was not an act of disobedience, I also recognized the power in the asking. As if I was taking control, even if that control was small. I took a sip of my water. Father hesitated for a moment and then frowned. He looked up and saw my mother standing in the kitchen, her eyes boring into his. He didn’t look away from her when he answered me. Thank you everyone for stopping by and checking out this post. :) I hope you enjoyed learning about KISSED. I love the cover of this book and the storyline. The excerpt left me hanging for me. Such a beautiful cover & I enjoyed the excerpt thank you. the cover is gorgeous, and it sounds interesting. Erin, Kai, Mary, Maiden, and Cassandra---Thank you so much!!! I appreciate your interest. Beckie, thank you for having me! You've been awesome.